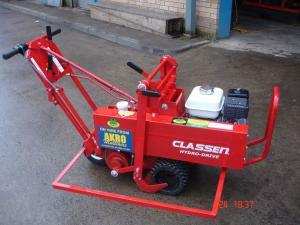 This is the Classen hydrostatic drive turf cutter You�ll get more done in less time with this turf cutter The hydrostatic drive delivers a smooth, consistent power flow with infinitely varied transport speeds of up to 4.7 mph. The power-reverse feature makes it easier to load and unload, and easier to maneuver. Whether your project is relocating or repositioning turf, expanding an existing flower bed, or establishing a new planting area, a Classen turf cutter gets the job done fast! This turf cutter should not be confused with the general hire companies turf cutters available and which we also have in the landscaping section. The cutting blade width is 450mm 18"
The power is supplied by a petrol Honda 6hp engine to a heavy drum dimple drive wheel for exceptional grip on the cutting turf surface.